No game update this week as the build that would have been pushed this morning had issues that would have affected PC players. Rare decided to hold off to ensure that all players had a enjoyable experience and release a stable update next week. Public and Private crews are coming. This means that you will be able to start up a locked full galleon by yourself, ensuring no random matchmaking players can join as you wait for the rest of your crew to jump online and join you. Gamertags that appear above players heads will now disappear below water. This gives players the much asked for stealth ability during PVP scenarios with other ships. The ability to share your resources with players without having to use the ships resource barrels is in the works. You will be able to hold out a consumable resource for another player to take from you. 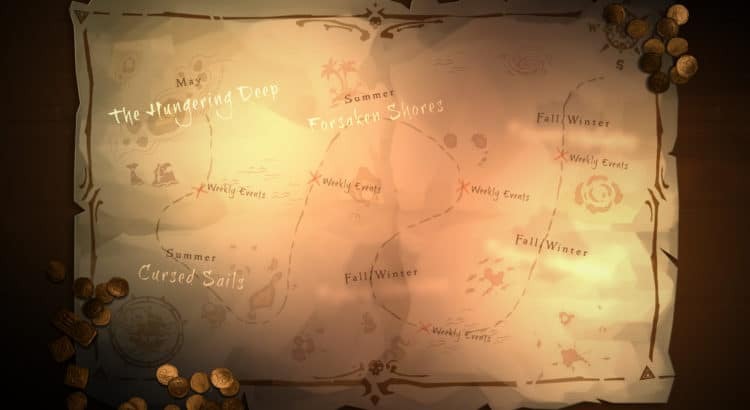 Lower chance of Castaway chests spawning for higher level voyages. And the biggie, a trailer for The Hungering Deep with release date will be released next week. Those are some of the big highlights from this weeks update. Be sure to watch the video to catch all the details and don’t miss the Hungering Deep trailer next week!